30-Minute Comedy Pilot In Color On Film. For Studio Purposes Only; Never Originally Shown On TV. at Malibu Beach, CA, in San Diego, CA and The Del Coronada Hotel. screen test); and November 13-23,1965 (this pilot). Make-Up Supervision: Ben Lane, S.M.A. During a rainy evening, a T.V. reporter, amidst a small crowd, conducts a man-on-the-street interview with Dr. Lionel B. Turner regarding innocent bystanders ignoring violence on the streets in which the doc swears his duty to defend anyone in need. They're soon interrupted by The Monkees—David, Michael, Peter and Micky—four talented musicians; they stage a mock assault on David, who calls to Dr. Turner for help to but he flees in fright. To avoid the reporter, the doctor ends up helping an old lady across the street who then charges him $.15 in return. for his kindness. The next day, Micky, at one end of the sidewalk, is seen struggling with a high stack of drum cases, precariously balancing one on top of the other. At the other end is Michael, riding on a motorized skateboard, taking a paper from a newsstand. They collide, causing Micky's cases to topple. Emerging from a nearby manhole is Peter, who applauds their hilarious pratfall. At the beach, a lone surfer rides in on the crest of a magnificent wave ...wearing a black wet-suit and horned rimmed glasses. He is Peter, who carries the board onto the beach. Then he quickly unzips his wet-suit. Underneath he is fully dressed, wearing a seersucker jacket, shirt, tie, and slacks. Meanwhile, people react to Michael ("Wool Hat"), who is travelling down the street at an unbelievably fast pace...because he's riding on his motorized skateboard. Outside Rudy's Record Rack, Micky pulls up on a Honda, immediately removes a canvas bag out of the saddle bag on the cycle, hops over to the parking meter which reads "Violation", and places the bag (which reads: "Out of order"!) over the top of the meter. Across the street, David's desperate efforts to get across are hindered by cars which speed by endlessly, and simply will not stop to let him cross, what with there being no traffic light. He then sees a Little Old Lady (obviously the same one Dr. Turner helped cross earlier) standing next to the bus stop sign on the corner, and, seeing his chance, takes her arm, and, holding his free arm up high, manages to finally stop traffic as they cross. In front of Rudy's Record Rack, The Monkees cluster outside the doorway to the store, their heads close together. They look around furtively, lift their wrists to check the time (despite not wearing watches! ), nod in agreement and burst into the store in the guise of trenchcoat gangsters (Michael, David and Peter carry guitar cases)! With Micky on drums and David, Michael and Peter on guitar, the four Monkees are then seen finishing their theme song. Later, The Monkees’ manager, Rudy Gunther, a 45 year-old ex-Marine Sergeant who's The Record Rack's proprietor, tells the foursome about a gig at The Riverdale Country Club. The owner, his old Marine buddy Charley Russell, is auditioning bands for his daughter Vanessa’s sweet sixteen party for $150 in cash. That night at the country club, Mr. Russell and Vanessa are sedately dancing to the square melodies of Sven Helstrom and his Swedish Rhythm Kings, although Vanessa isn't enjoying the music. When The Monkees arrive, both David and Vanessa get stars in their eyes upon sight as they become smitten with each other and Michael has to drag him to the stage. Soon they're performing the song “I Wanna Be Free” (the fast version) while David fantasizes about him, Vanessa and the guys having fun in the park and at the Kiddieland amusement park. After they finish, Mr. Russell hires them and soon David and Vanessa start going out. Vanessa is about to kiss Davy on her front porch at the end of their date when Mr. Russell interrupts. The following night, David is preparing for his next date with her as the guys start teasing him and at the end of that date (which ends at 1:00 in the morning!) David and Vanessa do get to kiss before she enters her home. Once inside, she's confronted by her parents who complain of her neglecting her studies for her history final to spend time with David. Vanessa swears she'll pass her final but she ends up flunking it instead. At the beach, Jill Gunther, Rudy’s 16 year-old daughter and Vanessa’s friend, explains to the boys that Vanessa will get a makeup final, but they are in danger of losing a job if she flunks it, too—and that her admirations for David is the reason for her failure to concentrate on her schoolwork. Upon hearing this, an upset David walks off in the middle of their volleyball game and strolls along the beach to a much slower rendition of “I Wanna Be Free.” Back at their pad, David expresses to Michael his guilt over Vanessa flunking and wants to help her. Michael declares a meeting and in a fantasy sequence, the guys are lawyers at the firm of Vanessa Russel and Vanessa in a board meeting who select David to help Vanessa pass her make-up exam. That night, the guys disguise themselves as deliverymen and sneak Vanessa out of the house in a big dresser drawer. The next morning, Mr. Russell complains to Rudy about Vanessa’s disappearance and Jill explains that The Monkees are only helping her pass her final. Meanwhile, The Monkees help Vanessa by dramatizing historical events with a musical number at the beach and an re-enactment of the Aaron Burr/Alexander Hamilton duel at the park that ends up scaring away picnickers until Mr. Russell's arrival sends the guys fleeing. Vanessa does indeed pass her make-up exam and at the party at the country club, Vanessa's teacher explains what The Monkees did for Vanessa but her rock-and-roll-hating father still refuses to let them in while Sven Helstrom and The Swedish Rhythm Kings perform in their stead, driving away the uninterested teenage guests. When The Monkees show up, the guard sends the away while inside Vanessa and then Mrs. Russell start crying until Mr. Russell relents. He goes outside to question the guard about The Monkees who informs him he sent them away as ordered but they hear the sound of The Monkees jumping over the wall. As the guard shines his flashlight on them there’s a fantasy sequence of them as fugitives dressed in black and white striped prison outfits in which ends with Micky in a hysterical fit at the sound of police sirens. As Mr. Russell is about to explain to the boys that they’re invited, they run off. Then he and the guard give them a wild comical chase all over the country club from the card room where they do another fantasy sequence as mavericks playing cards to the game room and a few times in the bar where they repeatedly knock a waiter carrying a tray of dishes down. When they enter the ball room, Mr. Russell explains that they’re invited and the guard replies that he sold out his country club and himself and storms off. To get Sven Helstrom and The Swedish Rhythm Kings off stage, Michael announces on the microphone that Norway just declared war on Sweden and that all Swedish Nationals are to report to their embassy and with that the band, patriotic beings they are, march off the stage. Then The Monkees gets the party rolling to the song “Let’s Dance On.” and everyone from the drunk at the bar, Dr. Turner and the old lady, Vanessa with another boy and Vanessa’s parents are dancing while the TV Interviewer, tries in vain to conduct a "Man-In-The-Ballroom" interview until he cracks up and dances along. From the bandstand, David sees another girl, and again sparks fly. Afraid that David’s new passion may cost them their first job (seeing as this is how all the trouble started to begin with! ), Micky, Michael and Peter, brandishing balloons as weapons, madly dash after David and chase him out of the ball room with the crowd in pursuit. A disastrous January 1966 test screening of the pilot for the Audience Studies Incorporated (ASI), a research subsidary of Screen Gems which measured samples of a viewing audience and tallied their findings via computer, sent Robert Rafelson into the cutting room for 2 days, which he spent inserting the "spontaneous, unrehearsed" screen tests of the boys at the very beginning of the pilot. Only then did Raybert Productions get what they so coveted from the National Broadcasting Company: firm commitment to at least 32 episodes of their strange new sitcom, The Monkees. Black and white segments of screen tests featuring Michael Nesmith and David Jones from October 1965 are shown at the beginning of this recut unaired pilot, as opposed to the aired version which shows the tests at the outset, which, as Robert Rafelson describes in a voiceover, are "spontaneous and unrehearsed." At the end of these interviews, Rafelson says, "Well, those are some of The Monkees. And you never know when they'll turn up next." Mike Elliot was a commercial director for the Screen Gems subsidary which would produce Monkees commercials for Kellogg's Rice Krispies and Yardley Black Label Aftershave. Different sound effects are heard during the Kiddieland romp sequence over Boyce & Hart's demo version of “I Wanna Be Free”, which is considerably faster than the actual track. The tempo in the demo of “Let’s Dance On” is much slower, which in turn extends the ballroom dance climax and accommodating some extra scenes of the dancers (but without Paul Mazursky's "man in the ballroom" interview segments!). In the end titles Micky Dolenz is credited under his Circus Boy moniker, Micky Braddock. Also note in these credits that there are no song titles listed (a distinction which would be repeated in the series' premiere, “The Royal Flush”), Don Kirshner is credited as Music Consultant instead of Supervisor (which was handled here by Ed Forsyth), Fred J. Brown provided the sound effects (before Raybert enlisted the services of Edit-Rite, Inc.), and Seymour Friedman was production supervisor (a position he also held for other Screen Gems sitcoms as Bewitched [ABC, 1964-72] and I Dream Of Jeannie [NBC, 1965-70]). All of the members of the guest cast didn't recieve credit in the original pilot, and wouldn't until NBC put the pilot on the air as the 10th episode of The Monkees TV series, almost a full year after it began production. The concept of the guard not letting The Monkees into the club was reused for the 1997 ABC-TV special Hey Hey It's The Monkees. Early names for the band include "The Creeps," "The Impossibles" (later used by Hanna-Barbera for a CBS Saturday Morning series debuting in 1966), "The Turtles" (already used! ), and "The Inevitables." Raybert finally settled upon the correctly-titled "The Monkeys," until they dropped the "y" in the name and substituted it with a second "e" (noting an impressive spate of rock combos with misspelled names [The Beatles, The Byrds, The Cyrkle, etc. ]), and thus and therefore, The Monkees were born. The initial names of the title characters in the pilot's script were "Biff", "Dicky", "Fred" and "Suds". There are several differences in the interior of The Monkees' pad: there is a regular staircase instead of a tornado staircase; the exit is on the right; and the living room layout is much different, for all of these shots were done in an actual beach house! The B&W screen tests of Michael and David were filmed on the set of The Farmer's Daughter (ABC, 1963-66), another Screen Gems production on which David Jones had earlier appeared performing Boyce and Hart's "Gonna Buy Me A Dog." Michael Nesmith gives brief mention of The Farmer's Daughter in his screen test. The tests probably foreshadow the concept of The Monkees TV series' end-of-show interview tags. Several clips from this unaired version of this pilot (including the opening, the ballroom dance, the Kiddieland romp, and the boys' disguises as escaped convicts) were used in the NBC-TV "Two In A Taxi" 1966-67 Fall Preview hosted by Jack Burns and the late Avery Schreiber. 2 publicity photos from the pilot can be seen on the rear of the LP More Of The Monkees. 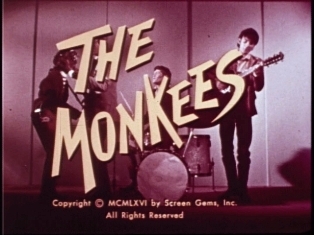 The trimmed down, recut 16mm version of the pilot, the very one which convinced NBC-TV to pick up The Monkees television series on January 17, 1966, currently resides as part of the personal collection of Monkee songwriter Bobby Hart, and has been used for the 1995 Deluxe Limited Edition Box Set and the 2003 Monkees Season 1 DVD Set. Aside from the special elements in the opening credit sequence and the musical numbers, it basically followed the same plot as the November 14, 1966 aired version on NBC. 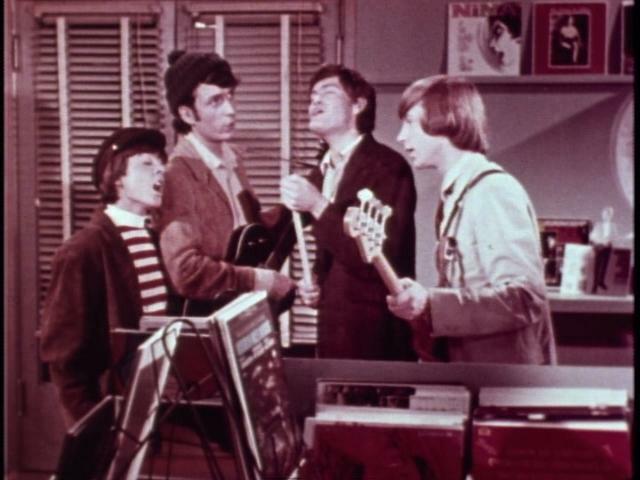 Some extra scenes such as Peter emerging from the ocean, carrying a surfboard and dressed in a wet suit, yet with his jacket, shirt, tie and trousers on underneath, Micky illegally parking his Honda motorcycle directly outside of Rudy's Record Rack (by placing an 'out of order' bag over the parking meter), and The Monkees gathering outside The Rack to synchronize and check watches which aren't there before bursting in disguised as gangsters carrying guitar cases, were deleted from the final cut of the original full-length (rejected) pilot episode, and was believed to be lost forever, surviving only as brief snippets in the recut pilot's end titles, the first season opening titles of The Monkees TV series, and in episodes throughout its ensuing run, until a print of the pilot from the estate of an NBC-TV executive recently surfaced.